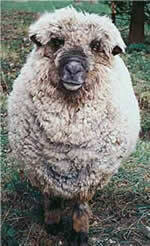 The Coloured Corriedale is a fixed Merino/Lincoln Longwool cross, which originated in New Zealand. It is tolerant of the UK climate, and produces a very heavy fleece. It lambs well. The coloured version is rare in this country. Corriedale sheep have a medium-fine, dense fleece with a long staple. This is often semi-lustrous and is useful for producing soft yarn and felt. Colours vary from pale silver through to black including various shades of fawn or moorit. It may be self coloured or occasionally spotted. Corriedale sheep produce a heavy, even bright fleece of good quality. It has a long dense staple with pronounced crimp, soft handle and an even tip. The fleece is very popular with spinners and can be used for a range of handspun garments.